Listening to iPods at unsafe volumes for as little as 5 minutes a day can cause hearing loss. Researchers Brian Fligor and Cory Portnuff estimate that a typical person could safely listen to an iPod for 4.6 hours at 70 percent of full volume using the supplied earphones without greatly increasing the risk of hearing loss. However, listening to an iPod at full volume for more than 5 minutes per day, they say, could increase the risk of hearing loss in a typical person. These guidelines apply in general to other music players, such as the Sandisk Sansa and the Creative Zen Micro, which they found to produce similar volume levels. In a separate study, researchers found that only 6% of iPod users listening in quiet environments turned their iPods up to unsafe levels. When in noisy environments, though, a full 80% listened at dangerous levels. When they used an “in-the-ear” earphone designed to block out background noise, only 20 percent exceeded sound levels considered to be risky. This suggests, says Fligor, that seeking out quiet environments and using “isolator” earphones designed to block out background noise help listeners avoid the tendency to play music at sound levels that can pose risks to their hearing. Portable music players have sparked recent concern that they could contribute to such noise-induced hearing loss, since they are used frequently and with earphones that deliver the sound directly to the ear. 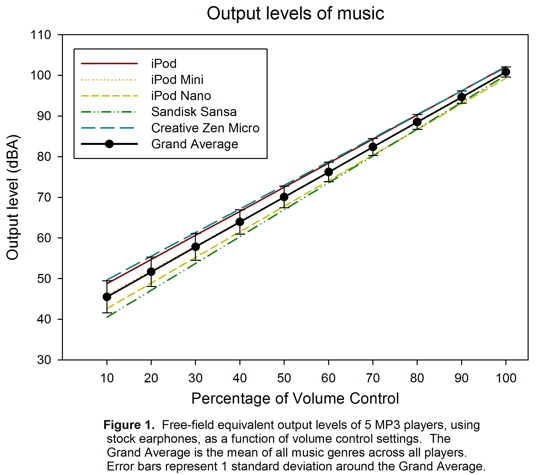 Portnuff and Fligor measured specific sound levels that come out of five portable music players: the Apple iPod, the Apple iPod Nano, and the Apple iPod Mini; the Creative Zen Micro; and the SanDisk Sansa. For each player, they measured sound levels in music transmitted several different types of earphones, ranging from the “stock” earphones that come with the products to “isolator” earphones that block outside noise, to “supra-aural” earphones that fit over the ears. They found that all five music players output very similar sound levels, especially at the highest volume levels. They also found no significant differences between sound levels in five different genres of popular music, especially when played the highest volume. But those highest volumes, the researchers point out, can be dangerous‚Äîso dangerous that the researchers only recommend listening at those levels a few minutes a day, if at all. To come up with their recommended listening times, the researchers compared the players’ volume levels to 85 dBA, the minimum sound level determined to pose the risk of hearing damage according to National Institute of Occupational Safety and Health (NIOSH) guidelines. With this in mind, Portnuff and Fligor say that typical individuals can listen to their iPods for a total of 1.2 hours a day with the supplied earphones if the volume is at 80 percent of maximum levels. Listening to iPods at full volume is not recommended for more than 5 minutes per day (if using the supplied earphones or other earbuds), 3 minutes per day (if using “isolator” earphones that block out background noise), or 18 minutes per day (if using “supra-aural” earphones that are placed over the ears rather than inside them). The maximum recommended listening times represent the amount of time that a “typical” person could listen to their portable music player every day without greatly increasing their risk of hearing loss. “It is important to note, though, that not everyone shares the same risk of hearing loss,” Portnuff explains. For some people who have “tougher” ears, he says, the recommendations are overly cautious. For other people with more “tender” ears, these recommendations do not eliminate the risk of hearing loss. “Today, however, we have no way of predicting who has ‘tough’ ears and who has ‘tender’ ears. Hearing loss occurs slowly and is often not noticed until it is quite extensive, so early prevention is the key,” Portnuff says.